Why Choose Hangsen E Liquid? 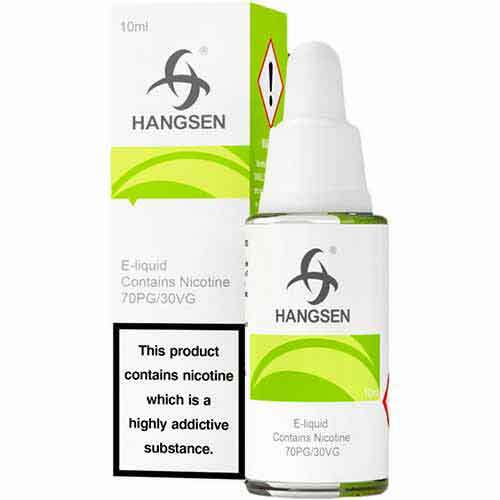 It's not hard to see why Hangsen e liquid is the worlds most popular and the best selling brand in the UK. With over 100 million bottles sold worldwide and more than 1000 employees, supplying over 80 countries worldwide, no other manufacturer compares to Hangsen when it comes to scale, knowledge or expertise in producing top quality, affordable TPD compliant e-liquid. Priding themselves as a company on natural extraction techniques in their tobacco and flavouring means you’re getting a quality product that takes you closer to the real appeal of e liquid flavours rather than relying on synthetic techniques. The 70% PG Hangsen Atom Series e liquid covers almost every type of flavour, ranging from tobacco and menthol flavours, to fruit and drink flavours and when it comes to tobacco and menthol you really don't have to look any further. Golden VGA Tobacco, USA Mix, or HS Premium Menthol Sensation and HS RY6 Premium tobacco are about as good as it gets to replicating the real thing. Selling 4 million bottles worldwide every month, Atom series are by far the most popular e liquids Hangsen has ever produced. With a combination of high quality ingredients, great tasting flavours and affordable prices, it's the perfect recipe for an extremely popular brand. With over 1000 e liquid SKUs submitted for TPD notification before NOV 2016, all Hangsen bottles are fully compliant with european TPD regulations. We understand that most customers prefer to stock up on their favourite Hangsen e liquid and we aim to give you the lowest possible prices by offering the best Hangsen UK Multi-Buy mix n match offer available where you can buy 10ml for just £1.69, giving you a saving of upto 43.4% on any Atom e liquid flavours. Your purchase is delivered to your door free of charge with our free UK delivery offer when you spend over £25.